There’s a lot of excitement around Emory’s Chapell Park heading into the 2015 season, and for good reason. Last year the Eagles finished with a 38-13 record, their third-most victories in a season, and played their way to a second place finish at the NCAA D-III Baseball Championship. Their path to Appleton, Wis. included an incredulous late season run that was sparked by a series win over highly ranked Birmingham Southern. 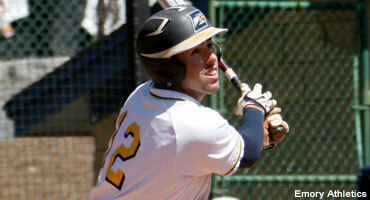 Emory used that momentum to go 9-1 in April and secure a postseason bid. The Eagles were dumped in their second game of the regional by Bridgewater, but went on to win four win-or-go-home contests, including two payback victories over BC, to advance to the College World Series for the fourth time in program history. Just as they did in the opening round, Emory spent the bulk of the CWS in the loser’s bracket as they dropped their opening game. Nevertheless the Eagles reeled off consecutive wins over the second, fifth, sixth and 12th ranked teams to advance to the championship against Wisconsin-Whitewater. Emory ultimately lost the final game, but gained what could be the final piece of the puzzle Head Coach Mike Twardoski’s team needs to win their first baseball title. Now armed with the experience of a deep, successful postseason run, along with the drive to take it one step further after watching Wisconsin-Whitewater dogpile after the final out, the Emory Eagles are Perfect Game’s Division III Preseason No. 1 team for the 2015 season. Much of EU’s success last season was due to a prolific hitting squad which scored the second-most runs in school history, and their 599 hits placed them second in D-III for the season. The Eagles return five everyday players who started at least 35 games from last season, four of who batted no less than .338. Leading the attack is All-American Brett Lake who batted .417 and led the nation with 69 RBI. Nevertheless, what puts Emory over the top this year isn’t their offense, it’s their talented pitching staff, which had a team ERA of 3.31 despite facing one of the most difficult schedules in D-III baseball. Four pitchers who started at least eight games will be back on the mound, including All-South Region senior Connor Dillman, who went 10-1 with a 2.35 ERA, and super sophomore Jackson Weeg, who led the team with a 2.03 ERA in a swing role. Also back is Kyle Monk who emerged as the Eagles’ closer and earned six saves in nine NCAA Championship games. Emory got the nod for preseason No. 1 in what could be described as a coin-flip decision over the reigning champion Warhawks. Like Emory, Wisconsin-Whitewater returns their top hitter in Mikole Pierce, a senior shortstop who led D-III in total bases last season, as well as a number of supporting sluggers. The defending champs also have a well-stocked, top-shelf pitching staff that will limit opposing offenses from the first pitch to the last out. The Warhawks will need to replace their two top starting pitchers from last season, which ultimately is what gave Emory the edge for the top spot in the preseason rankings. However, there are some suitable arms already on the roster that can certainly step up to help Whitewater claim back-to-back titles. Expect preseason No. 3-ranked Birmingham-Southern to make a strong challenge for the D-III crown as well after finishing at 35-12 last season. The Panthers have a trio of players who received preseason All American accolades on their roster, which includes their top batsman, starting pitcher and relief ace. Senior hurler Blake Stevens adds the preseason honor to already lengthy list of accomplishments he’s already received, including being the Southern Athletics Association Pitcher of the Year after posting a 1.02 ERA – good for fifth in the nation – while compiling 77 strikeouts in 85 innings with only 12 walks. Some dark horses to look out for this season include Rutgers-Camden, Amherst, St. Scholastica and La Roche. Of those clubs only the RUC Scarlet Raptors made the Preseason Top 25 cut, but don’t be surprised to see the Lord Jeffs, Saints or Redhawks crack the rankings sooner or later. Along with their top slugger being back on the roster, Rutgers-Camden can claim one of D-III’s top sophomores in Joe Brooks. Despite being only a freshman, Brooks led the NJAC in hitting at .421 last season and helped the Raptors win the regular season conference title and earn the program’s first NCAA tournament berth. Amherst has a good amount of talent returning to the diamond as well, including potential top 10 round draft pick Mike Odenwaelder, who hit .400 and also appeared in seven games as a pitcher. The 6-foot-6 prospect posted a 1.74 ERA and struck out 21 batters in 20 2/3 innings last season. St. Scholastica has been the longtime bully of the Upper Midwest Athletic Conference with a 266-8-1 record since 2000. La Roche has been breaking Redhawks’ win record totals each of the past three seasons and went 15-1 in the Allegheny Mountain Collegiate Conference last year. Each of these clubs have nationally ranked competition on their schedule this spring, and play each other as well, and can show they are more than just a conference or regional power.